Students: Attend the Cousin Reunion & Save the World? “‘Genealogical consciousness’ means seeing how past, present, and future are connected,” said Amy Harris, a BYU History professor in a recent BYU devotional. “Because developing genealogical consciousness requires that we think about strangers in the past, it develops the possibility of thinking about strangers in the present, and strangers in the future, to think about how our relationships and actions will last beyond death, will echo into future strangers’ lives.” In that sense, she asserts that family history, or the kind of awareness and activity one develops while doing it, just might “save the world.” And, “in a world of turmoil and uncertainty,” said L. Tom Perry, “it is more important than ever to make our families the center of our lives and the top of our priorities.” Thus, there is reason aplenty to attend Family History Week activities, and the Cousin Reunion in particular! 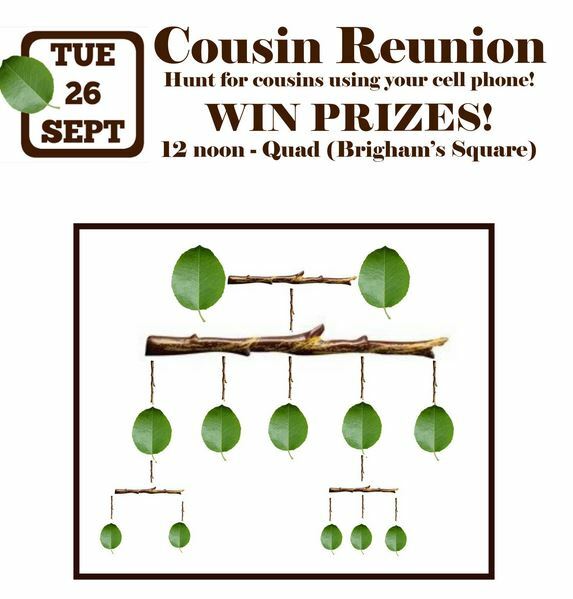 What and When is the Cousin Reunion? There will be prizes, and participants’ chances of winning will increase by logging into RelativeFinder and joining the group. Follow BYUFHProgram on Facebook if you have questions about the event, or problems with logging in. At last year’s Family History Conference, keynote speaker Paul Cardall spoke on the connection between family history and missionary work. “As for those whose hearts have turned, I believe we will see greater faith among people if we do the family history work,” he said. Beyond developing greater faith, though, there is the benefit, as Dr. Harris said, of “building lasting relationships and connections with other people, [which is] is the only way to live happy and meaningful lives. We are built to cooperate with and belong to not just our kin, but all humanity.” Check out FHWeek.byu.edu for more information about this event, and others during that week that can help students live happier, more connected lives.